William M. Calder III, Bernhard Huss, Marc Mastrangelo, R. Scott Smith, and Stephen M. Trzaskoma. The Unknown Socrates: Translations, with Introduction and Notes, of Four Important Documents in the Late Antique Reception of Socrates the Athenian. Bolchazy-Carducci Publishers, Inc. (www.bolchazy.com), 2002. Pp. 304 + xvi. Paperback $57.00. ISBN 978-0-86516-498-7. Some find Socrates incredibly irritating. They dream of hemlock. The rest of us may claim to admire or even love him. Alcibiades, rich, connected, and famously good-looking, tried to seduce him. Socrates, at least according to Plato, cuddled chastely. But can we believe him? What might other sources tell us about this famous philosopher we think we know so well? Socrates was, well, not always so Platonic. Although few have ever accepted Aristophanes' comic caricature (Clouds), the Socrates we find in Xenophon's Memorabilia and Apology provided a solid paradigm for the nineteenth century. It was the work of the last century to replace Xenophon's Socrates with the Socrates we find described by Plato. Today, most scholars agree that Socrates, who left no writings of his own, is difficult, if not impossible, to recover, as an historical figure. The five scholars who produced The Unknown Socrates acknowledge this difficulty, but are not daunted. They have assembled four essential but neglected sources that all readers may profitably navigate in search of their own Socrates: Diogenes Laertius' Life of Socrates, Libanius' Apology of Socrates, Maximus of Tyre's Whether Socrates Did the Right Thing When He Did Not Defend Himself, and Apuleius' On the God of Socrates. Each text is translated as well as supplied with an introduction, bibliography, and running commentary. The original texts (three in Greek and the last in Latin) are reprinted from good editions. A general introduction and foreword describe the genesis of the work, and explain why these sources matter. Even before his execution in 399 B.C., Socrates, these scholars argue, was making the transition from human being to idea he man was, in other words, a rock star. This much Aristophanes' Clouds demonstrated as early as 423 B.C. For ancient inquirers, as for us, access was soon limited to the image of Socrates, not the reality, whoever the "real" but irrecoverable Socrates may have been. These texts matter because they reveal Socrates' early image. Diogenes Laertius most likely lived in the third century A.D. and wrote Lives of the Eminent Philosophers . Diogenes uses biography to portray Socrates' pragmatically ethical character without the burden of philosophical theory. Despite the faults of his biographical method, our authors argue that Diogenes' portrayal has made an enduring contribution to Socrates' image. And, whether or not they are true, the anecdotes are suggestive. Might Socrates really have wed or had children by two women, perhaps at the same time, in order to help increase the number of citizens at Athens? (Diogenes claims that he learned this from Aristotle.) Socrates' patriotism emerges from this story as clearly as it does from his celebrated military service at Potidaea. Plato's Apology of Socrates remains famous; Xenophon's Apology less so. But Libanius? Libanius was a fourth-century A.D. pagan luminary who composed his Apology in a rapidly Christianizing world. Did Libanius have access to authentic historical documents now lost? Tantalizingly, Libanius constructs his defense to refute point by point the charges of Anytus, one of Socrates' original accusers. Not all these charges find counterparts in Plato or Xenophon, and, as our authors point out, these late antique rhetorical exercises have tremendous potential historical value. Libanius worked very carefully within the context of texts available to him, many of which are irrevocably lost to us. We may also read Libanius' defense of Socrates against charges of impiety in the early fourth century B.C. as a defense in the fourth century A.D. of classical Greek culture against attacks by a new Christian piety. The document thus fascinates in two ways: it adds to what we may know about Socrates, and it reveals to us that Socrates had become a rallying point in a late antique culture war. Although we have speeches that claim to represent Socrates' defense, did Socrates actually speak a word at his trial? In this book's third text, Maximus of Tyre, who was reportedly at work during the reign of Commodus (A.D.180-192), asks whether Socrates, by refusing to respond to the charges against him, did the right thing. Does this then imply that Socrates' contemporaries, Xenophon and Plato (not to mention all those who followed), merely composed their own fantasies of what Socrates should have said, had he spoken? Notable scholars have sided with Maximus against Plato, and Maximus' essay offers a rousing defense of Socrates' choice not to defend himself. Socrates, he claims, by refusing to engage with those beneath his philosophical dignity, kept to a higher moral ground, and the Athenians eventually paid the penalty for their impiety. Maximus writes: Because they [the Athenians] slighted Zeus, plague fell upon them, and so too war from the Peloponnese. Because they corrupted the youth, they suffered the misfortune at Deceleia, the catastrophe in Sicily, and the disaster at the Hellespont. This is how god passes judgment, this is how he condemns. (232) Apuleius (mid-second century A.D.) provides our fourth document. On the God of Socrates begins with a general examination of personal gods before it moves to a discussion of Socrates' daemon in particular (the god Socrates claimed spoke to him throughout his life, mainly to warn him not to do things). Apuleius concludes that we may all, by living the philosophical life, emulate Socrates' exemplary care for his personal god. This demonology helps us, as modern readers, make sense of a crucial ancient tradition that lacks ready parallels in our own at once more secular and relentlessly monotheistic age. No matter how we read these fascinating documents, we gain fresh insights. The Socrates who emerges interests us no less than Plato's or Xenophon's, and he may well shed light that helps bring other versions of Socrates into sharper relief. We observe too the irony that Socrates, who was condemned for impiety towards his ancestral religion, should become a rhetorical bulwark for traditional paganism as it struggled to stem the rising tides of a newer and increasingly aggressive faith. With this fine book in hand, one may truly say, "Socrates, we hardly knew you!" The title of this book was chosen with the presumption that the four works made available in it have generally fallen out of the consciousness of the nonspecialist audience, even that part interested in Socrates. After an eight-page general introduction, the volume presents for each work an introduction, an annotated translation, the original Greek or Latin text, and a select bibliogrpahy: Diogenes, Laertius, Life of Socrates, which emphasizes Socrates' deep ethical nature and extraordinary personality; Libanius, Apology of Socrates, which is based on sources now lost to us; Maximus of Tyre, Whether Socrates Did the Right Thing When He Did Not Defend Himself, which makes the claim that Socrates never spoke at his own trial; and Apuleius, On the God of Socrates, which treats at length Socrates daimonion. This valuable book has its origins in the collective reading of Libanius' Apologia Sacratis which took place in the meetings every other week or so, and extended over several pleasant months in 1996 and 1997. The Apologia was a true collective effort by all the contributors and the four works are presented here in an order that seems logical. The present work furnishes abundant material for translation. The Socratic works included here add intriguing dimensions to the portrait of Socrates. Teachers who wish to proceed more rapidly will have no difficulty in making their own selection. The lessons are not intended as home tasks, but to be translated in school and repeated at home. According to Diogenes Laertius in his Lives of the Philosophers, Socrates would sometimes so annoy his interlocutors in the agora and gymnasia of Athens that they would punch him and kick him, and even try to tear his hair out. Nor were things any better at home: a metaphorical torrent of abuse from his wife was liable to be followed by a literal drenching in water, like a rainstorm following thunder (as the sodden sage himself resignedly put it). Stories like these were once well known, but they are in striking contrast to the standard modern image of Socrates, derived almost exclusively from Plato. ‘Our’ Socrates is the man who has given his name to a method of education by questioning, a preoccupation with souls and care of the real self, and a modest refusal to claim knowledge of anything but his own ignorance. He is the earnest disputant, unconventional theorist and myth-making visionary, whose serenely heroic devotion to principle in the face of a scandalously undeserved trial and death sentence is commemorated in the Apology, the Crito and the Phaedo. The texts assembled, with helpful introductions and notes, in The Unknown Socrates reveal another Socrates, or series of Socrateses, all the more intriguing for their unfamiliarity. Besides Diogenes’ Life, there is Libanius’ Apology of Socrates, in which centuries of hindsight are exploited to imagine what else a friend might have said on Socrates’ behalf in court, besides what got into Plato’s script. Maximus of Tyre’s Whether Socrates Did the Right Thing When He Did Not Defend Himself also discusses the trial, but with a different starting assumption, that Socrates — realizing that neither a conventional speech of defence nor an attempt to educate his jurors in the short time available could win him acquittal on acceptable terms — chose to say nothing in court. Apuleius’ On the God of Socrates turns to Socrates’ divine sign (daimonion) — the mysterious inner voice or apparition so tantalizingly underexplained by Plato and Xenophon. Apuleius fits the case of Socrates into a larger picture of the hierarchy of divine beings holding together the physical and moral cosmos (daimones were — roughly — the angels of Graeco-Roman philosophical cosmology), and preaches a sermon on their contribution to the living of a good life. None of these texts is literally unknown to scholars, nor entirely inaccessible (in translation) to the general reader. The contributors to The Unknown Socrates are right none the less that they are understudied, works which have all too easily been dismissed as late, derivative, boring and largely untrue. None of them dates from fewer than five and a half centuries after Socrates’ execution in 399 BC. Diogenes’ Lives — so the conventional verdict has it — are the work of a mere compiler, bodging together second- or third-hand reports, and interested more in anecdote than in accuracy. Apuleius, Maximus and Libanius are rhetorical entertainers, whose sole aim is to tickle the jaded palates of an over-educated audience by reshuffling the dog-eared cards of a well-worn pack. But (to put it no more strongly for the moment) this sort of dismissiveness involves a huge waste of material. These four texts are representatives of a much more extensive phenomenon. Libanius, besides his Apology of Socrates, also composed a declamation On the Silence of Socrates, which can be read as a metaphorical lament for the progressive silencing of pagan literary and philosophical culture by Christian authority in the fourth century. Maximus of Tyre also composed studies of Socrates’ daimonion and his ‘art of love’ (erotike). Apuleius also wrote an Apology of his own in which, on trial for winning a rich widow’s affections by black magic, he cast himself as Socrates’ spiritual heir, a philosopher beset and imperilled by ignorant malice. This in its turn is just a fraction of a whole galaxy of Socratic material which survives from the Roman Imperial period, or which we know by report and fragment from both then and the preceding Hellenistic centuries. Socrates was a constant presence through the whole of antiquity, both as role model and as talking point. Socratic deaths, modelled on the Platonic Socrates of Phaedo, are everywhere projected by authors on to their heroes, as well as (it seems) consciously acted out by the subjects themselves (Seneca, Cato, Phocion); but Socratic lives are laid claim to as well, as in the contemporary, but divergent, Socratisms of the Stoic teacher Epictetus and the travelling orator Dio Chrysostom at the turn of the first century AD, both of them pupils of the so-called ‘Roman Socrates’, Musonius Rufus. Apuleius was not the only defendant to step, or be thrust, into the role of Socrates on trial. Correspondingly, the facets of Socrates that shimmer through ancient literary (and visual) culture, as topic and as model, in calm repetition and in anxious analysis, in satire and in celebration, are many and various: his trial and death; his relations to the city of Athens and its democratic constitution; the true nature and implications of his enigmatic divine sign; his real moral character (was he effortlessly virtuous, or did he have to struggle with a wayward lower nature? ); his sexuality and ideas of eros (just how ‘platonic’ were his own passions? ); his military record (how many foreign campaigns did he serve on? ); his interrogatory and pedagogical techniques; his domestic life with one or perhaps two wives (concurrently or sequentially? ); and last but not least his extraordinary (snub-nosed, pop-eyed, satyr-like) physiognomy. How and why did it come about that Socrates remained so good to think with and to argue through and over? Part of the answer lies in the sheer richness and provocative attractiveness of the picture that was inherited from the late fifth and early fourth centuries BC, from the first two or three generations of authors to discuss this individual who, famously, left nothing in writing himself. Besides Plato’s Socrates, there was also the staider, more conventionally moralizing Socrates of Xenophon, who was also (if more briefly) a pupil and almost exactly Plato’s contemporary. Besides Plato and Xenophon, there were (now lost or fragmentary) Socratic dialogues by Aeschines, Antisthenes and such minor Socratics as Phaedo and Simon the Cobbler. There were other Apologies, too, and, from the other side of the fence, a matching string of Prosecutions, keeping alive the contrasting perception of Socrates not as intellectual hero but as corrupter and traitor. From the end of the fourth century came the first full-fledged and apparently self-consciously, not to say gleefully, revisionary biography, by Aristotle’s pupil Aristoxenus of Tarentum, alleging inter alia that the supposed paragon was prey to fits of ungovernable anger. There was also, from the fifth century, the earliest of all these early portrayals, the satirical representation in Aristophanes’ Clouds, in which Socrates notoriously appeared slung aloft in a basket, ‘treading the upper air and thinking [his] way round the sun’. This body of writing stimulated and provoked, by handing on not an agreed Socrates, but a contested figure, full of apparent contradictions and manifestly the subject of fierce but unfinished arguments. It helped, too, that many of the works involved — above all Plato’s and Xenophon’s — so rapidly established themselves as classics of the literary-cultural heritage. To lay claim to true cultivation was, inescapably, to read about Socrates, and to read about Socrates was to be asked to take sides, solve puzzles, continue an argument. But to say only this is to omit a crucial factor, central both to the later tradition and indeed to the body of fourth-century writing on which it was based: Socrates’ identity as emblem and figurehead of an activity and an ideology uneasily but unavoidably located close to the heart of educated culture, the activity of philosophia. Although not everything written about him can be related directly to this role, it is, all the same, the central reason why he continued to matter, why the potential of the early material to inspire continued debate and reuse was realized in practice (and, indeed, why Socrates has resonated through medieval, Renaissance and modem culture, in its continued preoccupation with — and manipulation of — the claims of classical antiquity to intellectual and moral authority). The temptation to see here a glaring restatement of the obvious should be resisted. Ancient philosophia, an ‘art of living’ heavily committed to character formation as well as to theoretical argument, cannot be neatly assimilated to modem ‘philosophy’. The dynamics of its relationship with ancient society, and values more broadly, are by no means perfectly understood nor exhaustively discussed. And it was anything but a foregone conclusion that it should have been Socrates who became its figurehead and prime embodiment. Not only the role and status of philosophos, but also Socrates’ suitability to embody them had to be defined (or invented) by the self-constituted pioneers of philosophia, in a process combining accident with purposeful and interested manoeuvring. The main line of Socrates’ development towards the statusof patron saint of philosophia begins with Plato and Xenophon choosing (as they need not have done) to represent Socrates, as someone with unique truths to tell (or with uniquely effective way of telling truths) and to represent those truths as above all ethical. Aristotle adds his mite, with his general sense of philosophia as an activity with a history, and his own endorsement of Socrates’ claims to figure in it. These initially separate perceptions to Socrates’ favoured subject matter and of his place in a story of development) subsequently coalesce in the thought that in telling his ethical truths, he was responsible for an epoch-making innovation and so became a uniquely important point of diffusion for the subsequent development of genuine philosophia. But this coalescence could not happen straight away. It had to wait on still subsequent events, on the accident that, through the most exceptional of his con) memorators, Plato, Socrates could indeed be seen as setting the agenda for mainstream philosophia for the Hellenistic period. It is only thus that we arrive at the claim so famously preserved (but not invented) by Cicero, that ‘Socrates was the first to summon philosophy down from the heavens and set her in the cities and even bring her into homes’ — that is, that he invented ethics and thus first identified what philosophia was most importantly about. What is crucial to remember, however, is that this is not a process of simply grooming an appropriate candidate for a pre-existing role; it is part of the very invention of the activity of philosophia and the role and status of philosophos in a world previously innocent of them and presumed suspicious. The portrayal of Socrates as an extraordinarily charismatic individual is meant to win over, allay suspicion of the new, close the credibility gap that might otherwise yawn between ordinary opinion and a new species of intellectual eccentric; and at the same time, portrayal of his individual deeds, interests and characteristics helps to define the territory they lay claim to. And his constitution as shared ancestor, among other things, seeks to allay potential worry at the way the self-proclaimed pursuit of (a presumably unitary) truth tended so alarmingly to divide itself into competing and mutually recriminatory factions, with Plato’s Academy, Aristotle’s Peripatos, then Cynics, Stoics and Sceptics, all claiming unique purchase on the truth about the world and life. Equally, that very factionalism which Socrates could be invoked to heal generated a plurality of competing, polemical representations, as each sought to appropriate his authority for their own particular version of philosophia. Right from the start, there is a sense of competition between his principal early commemorators, Plato seeking to establish a sense of the worth of the philosophos as one with a transcendent, outsider’s view of conventional social, political and moral norms, whereas Xenophon’s project was rather to domesticate intellectual eminence and locate it safely within those norms, if in a privileged position. Antisthenes too, among the generation of the pupils, seems to have had his own distinctively ascetic and acerbic Socrates. Another couple of generations on, Socrates can be claimed both by Cynicism in its rejection of scholasticism, and Scepticism in its condemnation of the dogmatists. The only major Hellenistic philosophical school that did not lay claim to Socratic ancestry, the Epicureans, none the less backhandedly acknowledged his importance as a symbol in the vehemence of their rejection, branding him ‘that Athenian clown’. Holding as they did ethical and theological doctrines radically at odds with those of the mainstream of philosophical tradition from Plato, they had to look back on Socrates not as heroic founder and ancestor, but as the man who took philosophia in a disastrously wrong direction. Correspondingly, the sense of Socrates as ancestor, though it may have been usable to unite the other schools, could only exclude and marginalizethe Epicureans. Early Socratic literature, therefore, invites reflection on, and promises insights into, the process by which the identity of philosophia was invented and its relations with the surrounding culture first negotiated. In the same way, the continuing flow of Socratic writing, and the continued debating of Socrates, offers access to later stages of the same story, when philosophia had gained the sanction of long tradition, but still not lost its aura of marginality, of unwelcome challenge, or its vulnerability to attack, both from within the Graeco-Roman cultural order and from without. Lucian’s second-century Platonizing Socrates, for instance, articulates (satirically distanced) worries about philosophical values: true and authoritative for all their strangeness and their challenge to comfortable convention, or high-flown nonsense peddled by self-serving hypocrites? The Socrateses of early Christian propagandists echo and underline their larger uncertainties over strategy, whether to present their new values as a radical and exclusive alternative to Graeco-Roman tradition (with Socrates epitomizing the irredeemable error of pagan philosophia), or a realization and fulfilment of what was best in it (with Socrates as honorary Prophet). Others in all periods embraced the perceived difference of philosophia with greater warmth, redebating Socrates’ daimonion, or his trial, as a way of articulating their own claims to individual distinction or their sense of the proper hierarchy of authority. That neither earlier nor later Socratic writing has commonly been read in this way must be put down to a variety of factors. But prominent among them has been the particular form given to the ‘Socratic Problem’ in the foundational days of critical scholarship. According to this the prime task was to disentangle the true, historical Socrates from the conflicting evidence of the sources, among which the works of Plato and Xenophon had a significance categorically denied to any other. In Connop Thirlwall’s (1833) translation of Friedrich Schleiermacher’s classic formulation (1818): ‘What may Socrates have been, over and above what Xenophon has described, without however contradicting the strokes of character and the practical maxims which Xenophon distinctly delivers as those of Socrates; and what must he have been to give Plato a right, and an inducement, to exhibit him as he has done in his dialogues?’ Few scholars, if any, would now subscribe wholeheartedly to this formulation of the issue or to the presuppositions underlying it. Aelian’s story of visiting foreigners at the first performance of Clouds wondering, ‘Who is this Socrates?’, and being answered when the real Socrates stood up and displayed himself to their gaze, is implicitly agreed to symbolize a now unrealizable dream. But the effects of the traditional approach are to some degree still with us, precisely in the downgrading it has encouraged of any Socratic material not deriving from the first one or two generations of pupils and admirers. If it is abandoned, it is more likely to be in favour of the separate consideration of the Platonic or the Xenophontic Socrates (as part of an analysis of Plato or Xenophon) than for any broader consideration of the representations and uses of Socrates in ancient culture more generally. But the examination of the re-representations and reappropriations of Socrates in medieval, Renaissance and modern culture can bring us from refreshingly new angles to issues of their times — from civil disobedience and political nonconformity to ideas of sexual orthodoxy, via the recurrent urge to master culture by historical periodization — as well as enriching our sense of the continuing dialectic between present and (still, just?) privileged classical past. Equally, reading the representations of Socrates in antiquity, from the very earliest to the latest and most ‘derivative’, opens tempting vistas in the classical landscape. It is towards some of these that The Unknown Socrates invites us. The collaborative effort of William M. Calder III, Bernhard Huss, Marc Mastrangelo, R. Scott Smith, & Stephen M. Trzaskoma, The Unknown Socrates is an impressive evaluation of just who Socrates really was, as its contributors strive to separate the man from the myths and legends that have grown up around him throughout history. Four ancient text translations are offered: Diogenes Laaertius (Life of Socrates), Libanius (Apology of Socrates), Maximus of Tyre (Whether Socrates Did The Right Thing When He Did Not Defend Himself), and Apuleius (On the God of Socrates). 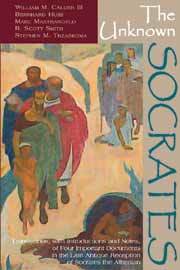 Offering introductions to four authors of antiquity and their works, translated texts with notes, the original Latin or Greek text of each work, and select bibliographies, The Unknown Socrates is a first-rate combination of primary sources and helpful interpretations. The Unknown Socrates is very highly recommended for Greek and Latin Studies reference shelves, as well as supplemental Socratic Philosophy reading lists.